This poster bugs me because Héctor wouldn’t be able to walk on the Marigold Bridge right here. I was late to the party for this year’s Reel Infatuation Blogathon (unlike last year) but I thought I’d write the post I had in mind anyway. I actually went back and forth a little, deciding who I’d write about (because while my list of fictional crushes is looooong there are only a few who I’m really obsessed with). 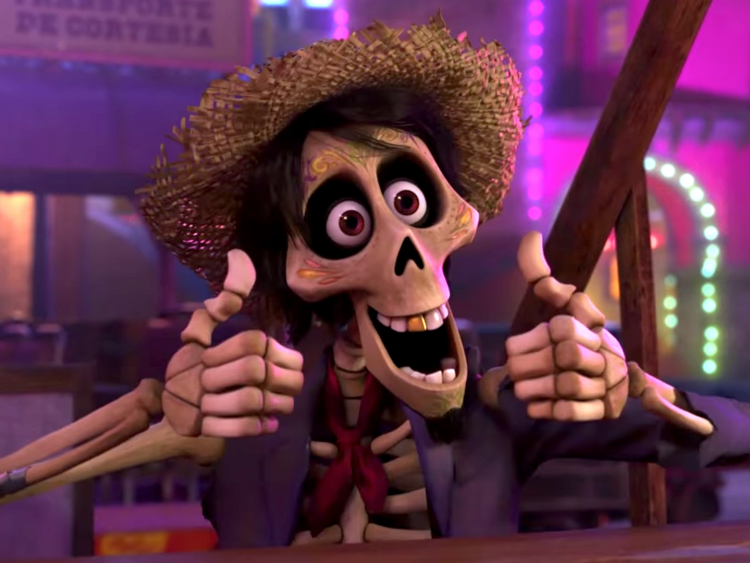 In the end, I decided to go with a fictional character I’ve known about for less than two weeks: Héctor from Pixar’s latest film, ‘Coco’. So, Lightning McQueen is still my favorite Pixar character. Definitely. But Héctor is close behind. For a lot of different reasons. Like how he actually was muy guapo. And his singing voice. (Gael García Bernal said that he wasn’t a professional singer and the director or whatever had to really coach him through the songs, but you could’ve fooled me! He does a perfect job.) And how he leads Miguel in the choreography for ‘Un Poco Loco’. And just…SO MANY THINGS. I could list tons of moments from the film that make me like Héctor a little more each time I see them. Okay, fine, I’ll just list a few more: when he apologizes to Miguel after the talent show but Miguel doesn’t hear him, everything in the sinkhole, ALL of his interactions with Imelda (especially when he accompanies her on ‘La Llorana’ and “I’m the love of your life?”), and when he sings for Cheech. The main thing that I find fascinating about Héctor is how my perception of him changed so much over the course of the movie. Because when you first see Héctor, he’s trying gain entrance to the Land of the Living by employing a Frida Kahlo disguise. It doesn’t work and when Héctor tries to dash across the Marigold Bridge that doesn’t work either. At this point, I thought Héctor would be a one-shot character, someone who was there to make add humour to the scene (and illustrate what happened when your photo isn’t on the ofrenda) and I didn’t expect to see him again. Then I thought that Héctor was a con artist (which he kind of is at the beginning?). I mean, he lied about getting front row tickets to Ernesto’s Sunrise Spectacular (though, to be honest, getting front row tickets wouldn’t have helped Miguel – he needed to be backstage). He didn’t lie to Miguel about anything else, though! Everything about Ernesto not being a great musician and all that was dead right (lol). Oh, and I totally called that Héctor would turn out to be a musician himself because it was just obvious, am I right? Héctor is SUCH a good friend. Singing Cheech’s favorite song and coaching Miguel before and during his ‘Un Poco Loco’ performance, etc. He’s also a great father (I’m getting emotional just thinking about him and Coco and all that). And another thing I like about Héctor is that he doesn’t care about fame and fortune anymore (#characterdevelopmentforthewin), he just wants to see his daughter again. I mean, he tells Ernesto that he doesn’t care anymore if Ernesto is the one who the world remembers, just as long as Ernesto lets Miguel take Héctor’s photo back. What a change from the young, foolish, pretty selfish guy who left his wife and little girl to do his own thing. He and Imelda are one of my favorite Pixar couples – they have issues to work through, but they do work through them and Héctor loves Imelda no matter what, no matter if she ever loves him again or not. In the end, when they’re dancing together to Miguel’s guitar playing…many tears are shed, let me tell you. Who’s your favorite character in ‘Coco’? And what’s your favorite song? And will you ever recover from the feels this movie gave you? I haven’t yet seen this film, but the animation from the trailer, stills, etc., look AMAZING! No wonder Héctor is your favourite character crush. It sounds like he has admirable qualities and is a true friend. When I see this film, I will definitely think of you. It’s an incredible film and, you’re right, the animation is unbelievable. Pixar continues to astound me with the amount of detail and the technological advances they introduce in each new movie. Héctor’s such a good friend. 🙂 I hope you love the movie when you see it! I would have to agree that Hector was such a great Disney/Pixar character. Great post! After thinking about it, I believe Imelda is my favorite character. She's both strong, and flawed, in a really believable and realistic way. She cares so much about her family, and she enjoys being the "boss" of the family–but she's ALSO humble enough to recognize when she's making the wrong decisions and needs to listen to others' ideas. Man…Imelda is one of my favorite Pixar characters now. I read a post that complained about how she's perceived as a 'strong female character', but only because she's bossy and demanding and I was like "NOPE. You've missed the entire gist of her character!" Sure, Imelda *can* be demanding and bossy at times, but she loves her family so much and tbh is way better mannered than a lot of 'strong female characters'. She's such an amazing woman. Loooove the way she sings. How could anybody say that?? *growls at them* She’s perceived as a strong female character because she IS strong! She’s guarded and protected her family through many very difficult decades, and continues to watch over them even after she’s dead. That takes real strength. And courage. What a great post about your choice!! I love what you wrote about Hector. I just saw this movie for the first time myself, though i didn’t love it. It was a really well-done movie, just not for me. But Hector and Imelda were pretty adorable. (I loved Dante and the big cat spirit animal the best). Yeah, I recently read your latest blog post and didn’t agree with your mini-review of the movie. 😉 Interesting that you like The Book of Life better! I didn’t love that one but I did think it was sweet. Personally, I liked every single member of Miguel’s family (living and dead). But what you said makes sense. 🙂 It bugs me when people say that ‘Coco’ is a rip-off of ‘The Book of Life’, though – they really are completely different movies. Yeah, but don’t forget, people are often silly creatures who don’t know how to look past the similar starting places to see the differences. All they see are that both movies share a protagonist who wants to be a musician denied and refused by family, both protagonists go to the Land of the Remembered accidentally to resolve their problems, and both use music to reconcile and save the day. People don’t look past that and the other elements and themes common to both films to see that the movies utilize those in different ways and for different purposes. Let’s see…where to start? I decided to give this film a try JUST because of your review! Not only was it amazing, I loved it far more than I expected, I’ve seen it three times now! Cry every time too! I totally agree about how we see Hector go through a very important character arc, by the time he encounters Miguel, he no longer cares about the stolen songs, the fame, or anything else except reuniting with his daughter. Though he makes a couple of passing of jabs at Ernesto, he never mentions to Miguel the theft of his music, or any of the other issues between the two men during their journey. In fact, he comforts Miguel in the sinkhole while still thinking at that point that he’s the great-great-grandson of the man he just learned MURDERED him. Don’t get me started on how believable they made the relationship between Imelda and Hector too! Definitely one of my favorite Pixar couples now! Thank you for this write up of the film, without which I might NOT have seen it! I've seen it so many times, too, and I cry every. single. stupid. time. It's so good and deep and emotional and it's AWESOME that you loved Héctor. You know, I never thought about how – as far as he knew – Miguel was the great-great-grandson of the guy who betrayed/murdered him and yet he was still such an awesome friend. GAH. Makes me love him even more. Yes! I have seen some people act like Imelda is a bit harsh on Hector, but she forgives him in the end! Furthermore, I think people forget that she suffered for DECADES, struggling to raise little Coco alone, missing the love of her life (and father of her child), and worst of all, probably NEVER KNOWING what happened to Hector at all. She didn’t know if he was dead, or if he’d left her for another woman, or that he’d changed his mind and decided to return after all. Is it OK if I add you on Google hangouts? You seem really cool from what I read here on your blog and I would love to chat sometime! I don’t think Imelda was too harsh on Héctor because he did do wrong by walking away from his family. And she still helps him and, eventually forgives him. ❤ SO MANY EMOTIONS. And I love how real Héctor and Imelda's relationship is…all those feelings and anger and love as well. That's a really good post! I agree with it as well. Sure you can add me. 🙂 I'd love to continue our discussions! Yeah, Hector is a great character. He starts off as this punk who mildly annoys Miguel. He seems like a criminal at times. But as the movie goes on, you learn so much about his character depth. You learn about him in a way that’s both believable and surprising. He stands out in a movie that already has plenty of great characters. I wouldn’t be surprised if, when I do put together my top 20 Pixar movie list, Coco will be in the top 5. Then again, Pixar has so many masterpieces that this list will be very difficult to put together. ‘Coco’ is definitely in my top three favorite Pixar movies but, yeah, it’s always tough to rank Pixar. The only easy choices on that list will be the bottom 4. Oh my goodness, here’s yet another post that I LOVE! I just recently watched ‘Coco’ after refusing to jump on the ‘Coco’ bandwagon last year when it was all the talk in terms of animated films. One day I was watching Netflix and decided to myself, what the heck, let me see if this movie is good or not. I was riveted from beginning to end and that incredible plot twist that Ernesto de la Cruz was really the villain and that Hector was truly Miguel’s great-great-grandfather was too much. I was crying a river of tears after that. I loved your assessment of Hector and how your view of him changed through the movie because the same thing happened to me. At the beginning when you see him he seems like the typical humorous sidekick who helps move the main character’s story along but as the movie progressed my view of him changed more and more. And then to find out all that stuff about his past and his dear love for his daughter Coco, gosh I was an emotional wreck! I usually see plot twists coming from a mile away, especially in animated films, but the twist about Hector was a total shocker and I loved it. And 'emotional wreck' doesn't even begin to describe how I felt after watching it the first time (and second, third, fourth…you get the picture). Miguel is an AMAZING character and I love him almost as much as Hector. He's so awesome.